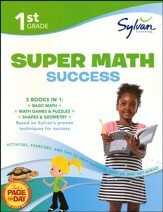 Three books in one, build your child's basic kindergarten math skills with this Super Workbook from Sylvan Learning! Full-color worksheet pages are filled with activities that will help your children master counting to 10, recognizing shapes, basic measurement, colors, letters, and more. 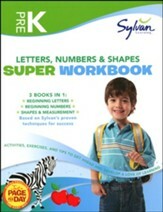 Included preschool Sylvan workbooks are: Beginning Letters, Beginning Numbers, and Shapes & Measurement. Simple directions guide students through a fun variety of math games and puzzles, as well as exercises to help students master basic skills. Circling, tracing, coloring, matching, and drawing activities are all included. 309 pages, softcover. Answer key sheets with reduced student-pages with overlaid answers are included; they are not perforated to easily tear-out, however. Grade Pre-K.
Three books in one, build your child's basic First Grade math skills with this Super Math Success workbook from Sylvan Learning! Full-color worksheet pages are filled with activities that will help your children master counting numbers from smallest to largest, place-value, recognizing different shapes, and more. Simple directions guide students through a fun variety of math games and puzzles, as well as exercises to help students master basic math skills in arithmetic, shapes, and geometry. Circling, tracing, cut-out, connect-the-dot, matching, and fill-in-the-blank activities are all included. 320 pages, softcover. Answer key sheets with reduced student-pages with overlaid answers are included; they are not perforated to easily tear-out, however. Grade 1. Teaching children to problem-solve in a number of different ways, rather than just trying to get them the right answer, Basic Math Success gives children a solid skill set that will be crucial for their success in math. Fun features like Hide and Seek (counting familiar objects), what comes next (picture patterns), Pond Crossing (number sequencing), and other activities that teach sorting skills, size and weight comparison, tracing and writing numbers, similarities/differences, shapes, and more are included. 122 full-color pages, softcover, answer key with reduced student pages included. Grade K.
Teaching children to problem-solve in a number of different ways, rather than just trying to get them the right answer, Basic Math Success gives children a solid skill set that will be crucial for their success in math. Fun features like "Building Times Two" (multiplying) and "Fashion Fractions" (a relatable way to use fractions) are included, as well as other activities that teach measuring length/liquid volume/weight, calculating change, geometry, division, and more. 122 full-color pages, softcover, answer key with reduced student pages included. Grade 3. 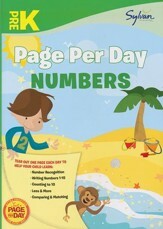 Familiarize children with numbers and counting with Sylvan Learning's full-color workbook. Children will learn to write numbers from 1 to 10, and compare and match numbers. 64 pages, softcover. Grade Prek/Preschool. 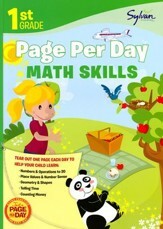 Familiarize children with numbers, counting and shapes with Sylvan Learning's full-color workbook. Children will learn about picture and number patterns, estimation & comparison, and practice classification and sorting. 64 pages, softcover. Grade K.
Familiarize children with numbers, counting, and shapes with Sylvan Learning's full-color workbook. Children will learn to count money, add and subtract, and tell time through simple hands-on activities. 64 pages, softcover. Grade 1. Help your student develop their math skills with Sylvan's Math Flashcards. The variety of selected drills will help prepare kids for school and mathematic success. The front of the card features a problem; the back provides the answer & the concept being reviewed. Leveled for difficulty, the tabbed card and color-coded mastery meter along the side of the box will help you keep track of which skills students have mastered and which could use more work. Rounded corners. Non-laminated paperweight cardstock. Grade Pre-K/Preschool. 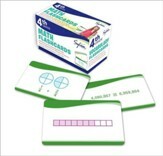 Help your student develop their math skills with Sylvan's Math Flashcards. The variety of selected drills will help prepare kids for school and mathematic success. The front of the card features a problem; the back provides the answer & the concept being reviewed. Leveled for difficulty, the tabbed card and color-coded mastery meter along the side of the box will help you keep track of which skills students have mastered and which could use more work. Rounded corners. Non-laminated paperweight cardstock. Grade K/Kindergarten. 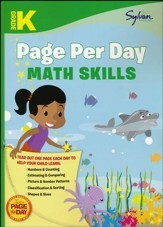 Help your student develop their math skills with Sylvan's Math Flashcards. The variety of selected drills will help prepare kids for school and mathematic success. The front of the card features a problem; the back provides the answer & the concept being reviewed. Leveled for difficulty, the tabbed card and color-coded mastery meter along the side of the box will help you keep track of which skills students have mastered and which could use more work. Rounded corners. Non-laminated paperweight cardstock. Grade 2. 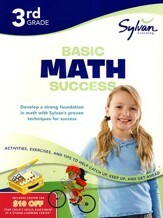 Help your student develop their math skills with Sylvan's Math Flashcards. The variety of selected drills will help prepare kids for school and mathematic success. The front of the card features a problem; the back provides the answer & the concept being reviewed. Leveled for difficulty, the tabbed card and color-coded mastery meter along the side of the box will help you keep track of which skills students have mastered and which could use more work. Rounded corners. Non-laminated paperweight cardstock. Grade 3. Help your student develop their math skills with Sylvan's Math Flashcards. The variety of selected drills will help prepare kids for school and mathematic success. The front of the card features a problem; the back provides the answer & the concept being reviewed. Leveled for difficulty, the tabbed card and color-coded mastery meter along the side of the box will help you keep track of which skills students have mastered and which could use more work. Rounded corners. Non-laminated paperweight cardstock. Grade 4. 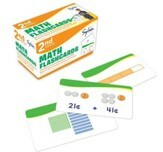 Help your student develop their math skills with Sylvan's Math Flashcards. The variety of selected drills will help prepare kids for school and mathematic success. The front of the card features a problem; the back provides the answer & the concept being reviewed. Leveled for difficulty, the tabbed card and color-coded mastery meter along the side of the box will help you keep track of which skills students have mastered and which could use more work. Rounded corners. Non-laminated paperweight cardstock. Grade 5.